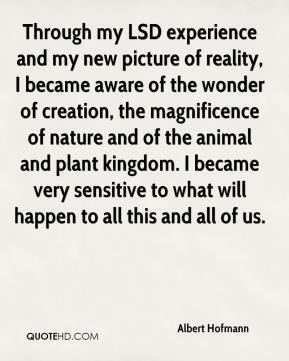 In old times, and also in our time among the Indian tribes, psychedelic substances were considered sacred and they were used with the right attitude and in a ritual and spiritual context. 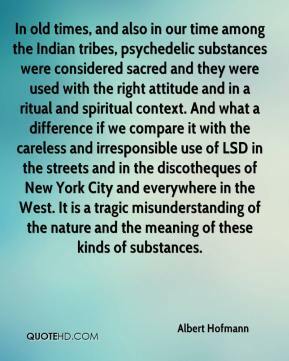 And what a difference if we compare it with the careless and irresponsible use of LSD in the streets and in the discotheques of New York City and everywhere in the West. It is a tragic misunderstanding of the nature and the meaning of these kinds of substances. It was an April day and I went out into the garden and it had been raining during the night. 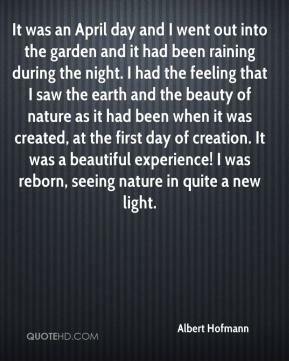 I had the feeling that I saw the earth and the beauty of nature as it had been when it was created, at the first day of creation. It was a beautiful experience! I was reborn, seeing nature in quite a new light. 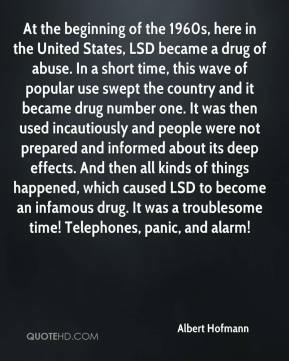 At the beginning of the 1960s, here in the United States, LSD became a drug of abuse. In a short time, this wave of popular use swept the country and it became drug number one. It was then used incautiously and people were not prepared and informed about its deep effects. 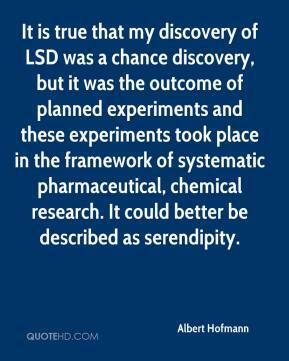 And then all kinds of things happened, which caused LSD to become an infamous drug. It was a troublesome time! Telephones, panic, and alarm! 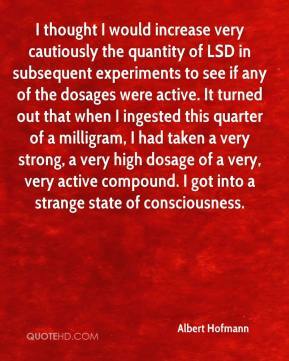 I thought I would increase very cautiously the quantity of LSD in subsequent experiments to see if any of the dosages were active. It turned out that when I ingested this quarter of a milligram, I had taken a very strong, a very high dosage of a very, very active compound. I got into a strange state of consciousness. This is a wonderful birthday party we are having. 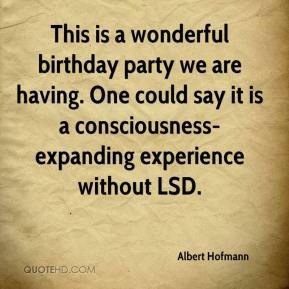 One could say it is a consciousness-expanding experience without LSD. 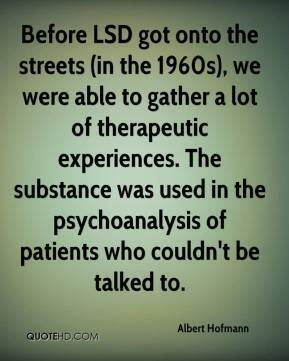 Before LSD got onto the streets (in the 1960s), we were able to gather a lot of therapeutic experiences. 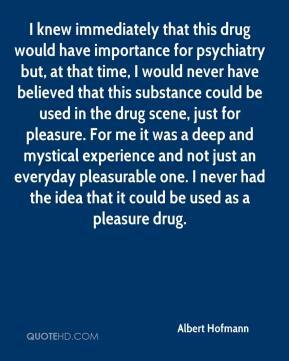 The substance was used in the psychoanalysis of patients who couldn't be talked to. What began as a miracle substance subsequently became a youth cult drug, and thus a political danger for America. 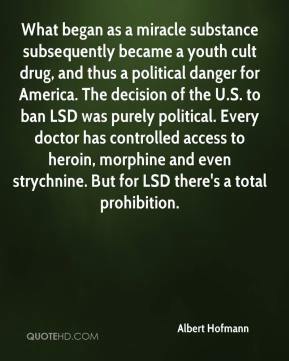 The decision of the U.S. to ban LSD was purely political. Every doctor has controlled access to heroin, morphine and even strychnine. But for LSD there's a total prohibition. 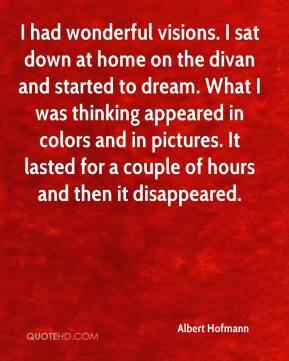 I had wonderful visions. I sat down at home on the divan and started to dream. What I was thinking appeared in colors and in pictures. It lasted for a couple of hours and then it disappeared.